Heat oven to 425°F. Lightly spray 15x10-inch pan with sides with Crisco® Original No-Stick Cooking Spray. Spread 1 cup of the crushed chips in shallow dish. In large bowl, mix turkey, flour and cheese and salsa dip. Stir in remaining 1/4 cup crushed chips; mix well. Form into 1 1/2-inch balls. 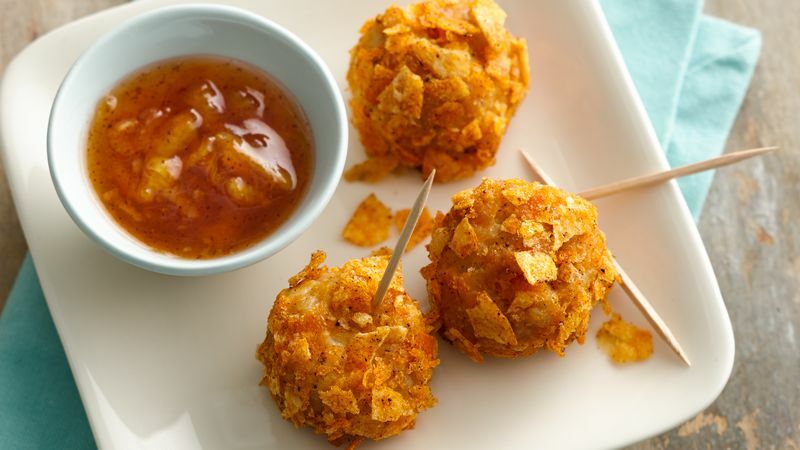 Roll each ball in crushed chips; place in pan. Bake 12 to 15 minutes or until lightly browned and thermometer inserted in meatballs reads 165°F. Let stand 5 minutes. Meanwhile, in small microwavable bowl, mix marmalade, lime juice and chili powder. Microwave on High 45 to 60 seconds or until bubbly. Serve warm with meatballs.